Navajo Lake is the largest lake in the Durango and Southwest Colorado area. A portion of the lake extends south into Northern New Mexico, so it serves lake enthusiasts in both states. 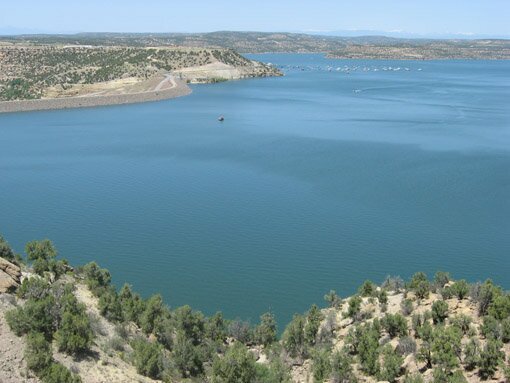 Navajo Reservoir, created by the Navajo Dam, is 35 miles long, has a water surface area of 23 square miles and features 159 miles of shoreline. Navajo is indeed a large lake and is Colorado's answer to Lake Powell. As a deep, wide open lake, there are no limits on boat-size permitting fishing and water-skiing power boats as well as large houseboats. The lake sets at an elevation of about 6,000 square feet and is open year-round. Nominal fees are charged. The lake is an angler's dream with an abundance of a variety of fish. Fish all year. Rumor has it that the Colorado north-end of the lake is best for Northern Pike, Largemouth Bass, Smallmouth Bass, Crappie, Trout, Bluegill and Catfish that can reach over 25 pounds. Although some Kokanee Salmon can be caught on the Colorado end, they are more abundant at the New Mexico southern end of the lake. The main body of the lake and the lake's numerous arms produce good salmon fishing. If you are going to fish both ends of the lake, fishing licenses for both Colorado and New Mexico are required which are available at the marinas. If you get tired of fishing and water-skiing, you can enjoy sightseeing in your boat and the beauty of nature. Winter is the best time to view wildlife. Bald Eagles usually arrive early in December and winter in the area, perching in trees overlooking the lake where they can hunt for fish. Deer will often wander into the campgrounds and picnic areas. Migrating Canadian Geese often camp out for the winter or stop-over on their way to warmer climates. The landscape is desert-like with pinon and juniper pine along the shores which provide habitat for varieties of other wildlife. The area has evidence of ancient villages that were once occupied by Ancestral Puebloan Native Americans. Keep your eyes open for those sites and by all means do not disturb those areas and keep them protected. Take U.S. Highway 160 east from Durango, Colorado to State Highway 172, about 5 miles. Turn right and take State Highway 172 south to Highway 151 in Ignacio, about 20 miles. Turn left and take State Highway 151 east to County Road 982 in Arboles, about 18 miles. Turn right and take County Road 982 to Navajo State Park entrance, about 2 miles. The southern end of Navajo Reservoir that extends into New Mexico is administered by New Mexico State Parks. Two shoreline areas near the dam feature over 200 camping and picnic sites, and two improved boat ramps and a marina. The river shorelines below the dam are also part of the state park, as well as a BLM Recreation Area. Pine River, the most developed area along the lake, includes a visitor center with interpretive exhibits, developed campgrounds, a day use area and a full service marina. Sims Mesa is across the lake, accessible by NM 527, and includes a visitor center with interpretive exhibits, developed campgrounds and a full service marina. The San Juan River area below the dam is world renowned for excellent trout fishing and includes wheelchair-accessible fishing facilities on the river, Cottonwood Campground, seven day use areas and several hiking trails.